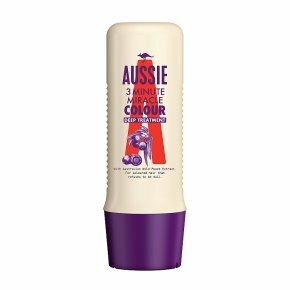 Our Aussie 3 Minute Miracle Colour Mate formula, with Australian Wild Peach extract (an Aussie favourite), deep conditions to replenish your coloured hair. And top it all off, may we suggest Aussie Miracle Colour Insurance? Replenishes coloured hair to keep it vibrant and full of life. Just like you. This amazing concoction takes only 3 minutes to take care of dull hair. With Australian Wild Peach extract. For vibrant, coloured hair that refuses to be dull. Stay colourful.Dull? You? Nuh-uh! No way. This amazing deep treatment concoction, with Australian Wild Peach extract, takes only 3 minutes to take care of dull hair, turning it into a whole heap of vibrant, luscious yumminess. We wish we could take the credit for finding such an extraordinary ingredient, but the indigenous Australians used ground up wild peach kernels to condition their hair centuries ago. Go them! ..And go us, of course!